Average mercury content of coal shipped to power plants during 1999, by U.S. county-of-origin. The U.S. Environmental Protection Agency (EPA) is expected to issue new rules limiting mercury emissions from coal-fired electric power plants by March 15, 2005, with enforcement beginning as early as April 2008. Those of us who remember playing with mercury in grade-school science class or from an accidentally broken thermometer may wonder why the EPA is concerned about mercury emissions. After all, mercury is a naturally occurring element that is added to eye drops, childhood vaccines, and dental fillings. Moreover, mercury emissions from power plants do not make the air hazardous to breath, or the water unsafe to drink. In a word, the problem with mercury is fish – and not just any fish, but large freshwater fish coveted by recreational fishermen, as well as a few ocean fish sold at the grocery store (swordfish, shark, king mackerel, and tilefish). Government guidelines say that children, and women of childbearing age, should not eat these fish because they contain potentially hazardous amounts of methylmercury, which is a highly toxic, mercury-containing organic compound. Regularly eating fish that contains high amounts of methylmercury can cause neurological damage in developing fetuses and children, which results in diminished cognitive, motor, and verbal abilities. In its December 2000 finding that regulation of mercury emissions from coalfired power plants is appropriate and necessary, the EPA determined that there is a plausible link between mercury emissions from coal-fired power plants and methylmercury concentrations in fish. This determination was largely based on the observation that coal-fired power plants are the largest human source of mercury emissions in the U.S. Indeed, as much as 20 percent of the mercury deposited in the U.S. originates from coal-fired power plants. Other major sources include municipal and medical waste incinerators (17 percent), chlorine plants (3 percent), and hazardous waste incinerators (2 percent); these sources have already been regulated. Finally, at least 40 percent of mercury deposition in the U.S. is from sources that are not easily controlled (international sources, natural emissions, and re-emission of accumulated human emissions). Atmospheric mercury becomes a problem when it is deposited by rainfall and enters streams and lakes where some of it is converted by microbes into methylmercury. The methylmercury is concentrated through the food chain and can reach high levels in large predator fish. Fortunately, fish from Utah rivers, lakes, and reservoirs do not contain harmful levels of mercury. Likewise, nearly all commercial fish, such as salmon, catfish, canned light tuna, and the generic breaded fish stick, are also considered safe (and nutritious) for young women and children to eat. However, the low mercury content of fish in Utah is little comfort to recreational and subsistence fishermen in the upper Midwest and New England where mercury advisories have been posted for nearly all inland and coastal water bodies. Mercury emissions from coal-fired power plants originate from trace amounts of mercury in coal. Although the average mercury content of U.S. coal is similar to the average crustal abundance of mercury (~0.08 parts per million), the enormous amount of coal burned in the U.S. results in potentially large mercury emissions. For example, 950 million tons of coal containing 75 tons of mercury was burned at nearly 500 U.S. power plants during 1999. About 30 tons of this mercury was effectively trapped in coal-ash waste or desulfurization residues. The remaining 45 tons of mercury was emitted to the atmosphere with the stack gas. The mercury content of U.S. coal varies geographically. High-mercury coal is produced from the northern Appalachian region (Ohio and Pennsylvania), whereas low-mercury coal is produced in Utah and other western states. 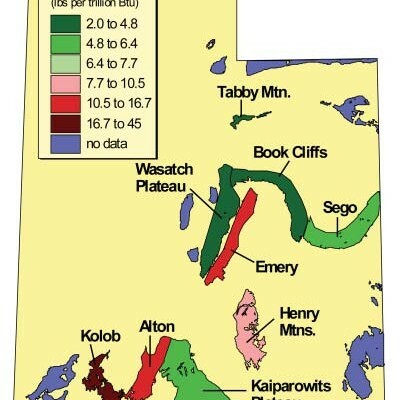 The low-mercury coal currently produced in Utah originates from the Wasatch Plateau and Book Cliffs coalfields. However, not all Utah coalfields have low-mercury coal. 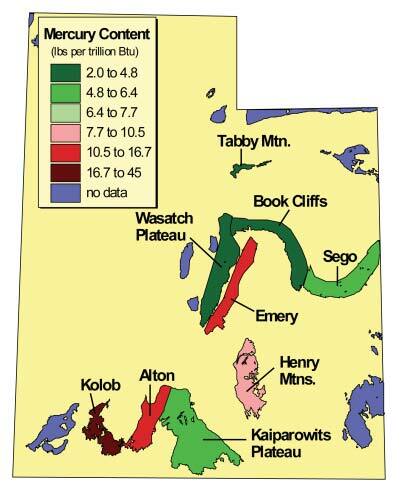 For example, coals in the Alton, Emery, and Kolob coalfields have relatively high mercury contents. Future production is especially likely from the southern part of the Emery coalfield. This area has thick coal beds, is close to central Utah electric utilities, and has favorable mining conditions. Besides geographic variation, the mercury content of coal also varies from bed to bed. 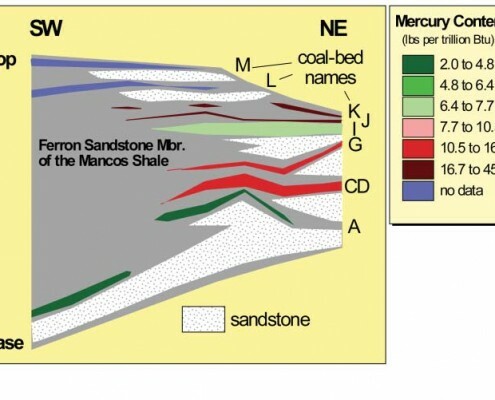 For example, although the average mercury content of coal in the Emery coalfield is relatively high, the mercury content of some coal beds is relatively low. 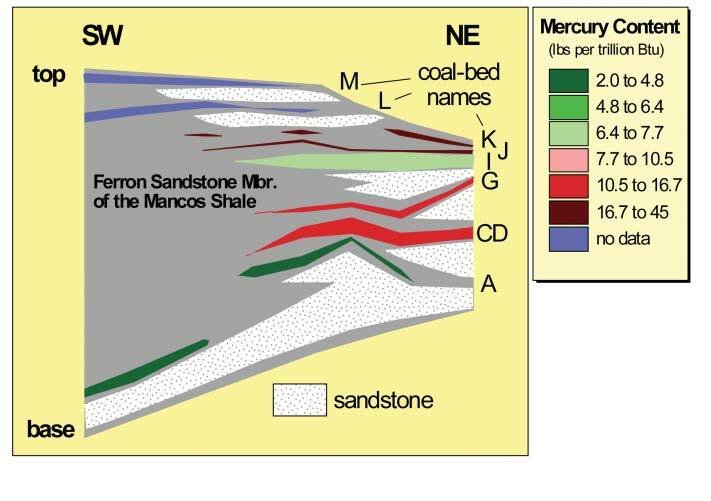 Recent work in Canada, Indiana, and Kentucky has also shown substantial variation of mercury within individual coal beds; similar intra-bed variation is likely for Utah coal beds. Because earlier rules limiting sulfur emissions from power plants effectively increased demand for low-sulfur Utah coal, an analogous outcome from the new rules might be anticipated for low-mercury Utah coal. This analogy is misleading. Because the Clean Air Act classifies mercury as a toxic pollutant, larger emission reductions may be required for mercury than for sulfur. Moreover, unlike sulfur emissions, which can be controlled using stackgas scrubbers, a universally effective technology to control mercury emissions does not exist. Although stackgas scrubbers effectively control both sulfur and mercury emissions from power plants burning eastern U.S. coal, scrubbers do not reduce mercury emissions from power plants burning western U.S. coal. Consequently, modern coal-fired power plants with particulate filters and stack-gas scrubbers that burn high-mercury eastern coal can have lower mercury emissions than similarly configured power plants that burn low-mercury western coal. This different behavior of eastern and western U.S. coal has been attributed to the higher chlorine content of eastern coal, which promotes the formation of ionic, water-soluble forms of mercury in the stack gas that is readily trapped by conventional (wet) stack-gas scrubbers. Other elements that may influence the effectiveness of mercury-control technologies include the iron, sulfur, sodium, and calcium in coal; eastern and western U.S. coals contain substantially different amounts of these elements. In recognition of the lack of universally effective technologies to control mercury emissions from power plants, the EPA has proposed less stringent mercury emission limits for plants that burn western subbituminous or lignite coal. However, as currently proposed, the rules require power plants that burn Utah bituminous coal to meet the same emission limits as plants burning eastern bituminous coal. Meeting these limits may prove challenging for both Utah coal producers and consumers. Pavlish, J.H., Sondreal, E.A., Mann, M.D., Olson, E.S., Galbreath, K.C., Laudal D.L., and Benson, S.A., 2003, Status review of mercury control options for coal-fired power plants: Fuel Processing Technology, v. 82, p. 89-165. Quick, J.C., Brill, T.C., and Tabet, D.E., 2003, Mercury in US coal – observations using the COALQUAL and ICR data sets: Environmental Geology, v. 43, p. 247-259. Seigneur, C., Vijayaraghavan, K., Lohman, K., Karamchandani, P., and Scott, C., 2004, Global source attribution for mercury deposition in the United States: Environmental Science Technology, v. 38, p. 555-569. U.S. Environmental Protection Agency, 2004, Electric utility steam generating units national emission standards for hazardous air pollutants: Online, , accessed April 2004. U.S. Environmental Protection Agency, 2004, Joint federal advisory for mercury in fish – what you need to know about mercury in fish and shellfish: Online, , accessed April 2004. Glad You Asked: What are seismic surveys?